How do four Jamo powered subwoofers compare? We took a quick look at four of their J-Series subwoofers when they first debuted. Although introduced in 2014, they are still available and continue to receive favorable user reviews. The J 10 SUB and J 12 SUB are designed to complement Jamo's Studio Speaker line (S-series), while the higher end J 110 SUB, and J 112 SUB, are designed to be a better match for their Concert Series line (C-Series). Jamo is based in Denmark and is part of the Klipsch Group (aka Klipsch Audio Technologies), which is headquartered in Indianapolis, Indiana. All four subwoofers incorporate MDF (Medium Density Fiberboard) cabinet construction and feature a bass reflex design. The drivers are front firing and are additionally supported by a rear port (round on the J 10 and J 12, and slotted on the J 110 and J 112. For connectivity and control, all four subs are equipped with LFE and RCA Stereo Line inputs for compatibility with any home theater receiver that has a subwoofer or two-channel preamp outputs. However, it must be noted that none of the subs in this line provide speaker level (hi-level) inputs, and there are no outputs that allow multiple subwoofers to be connected together. However, if you have a home theater receiver with dual subwoofer outputs, you can connect two subwoofers that way. On the other hand, one connectivity bonus on J 110 and J 112 subwoofers is the inclusion of wireless connection port for Jamo's Optional WA-2 Wireless Subwoofer Kit (the wireless subwoofer kit is also compatible with select Energy, Klipsch, and Mirage Subwoofers as well). This means less cable clutter, as well as more flexibility with room placement. Auto Standby Power—This feature maintains a low power mode and when a low-frequency signal is detected the subwoofer fully activates. Phase (0 or 180 degrees)—This feature helps to match the in and out vibrations of the subwoofer's speaker cone with the rest of your speakers. Crossover—This setting option allows you to set the best frequency point where the subwoofer takes over from the rest of the speakers. Gain (volume) controls—This allows you match the sound output of the subwoofer with the rest of your system so that when you adjust the volume using your home theater receiver the sound level relationship between the subwoofer and the rest of your speakers remains constant. Here is a rundown of their features so you can see which might be right for your home theater and audio set-up. - Driver Size: 10-inches (Aluminized Polyfiber Cone). - Power Output Capability: 150W (continuous), 300 Watts (peak). - Dimensions (HWD): 14.5 x 12.5 x 16.8 inches. - Driver Size: 12-inches (Aluminized Polyfiber Cone). - Dimensions (HWD): 16.5 x 14 x 19.6 inches. - Dimensions (HWD): 15.63 x 14.88 x 16 inches. - Driver Size: 12-inches (Injection Molded Graphite woofer with Hard Conical Cone). - Dimensions (HWD): 17.63 x 17 x 18.5 inches. 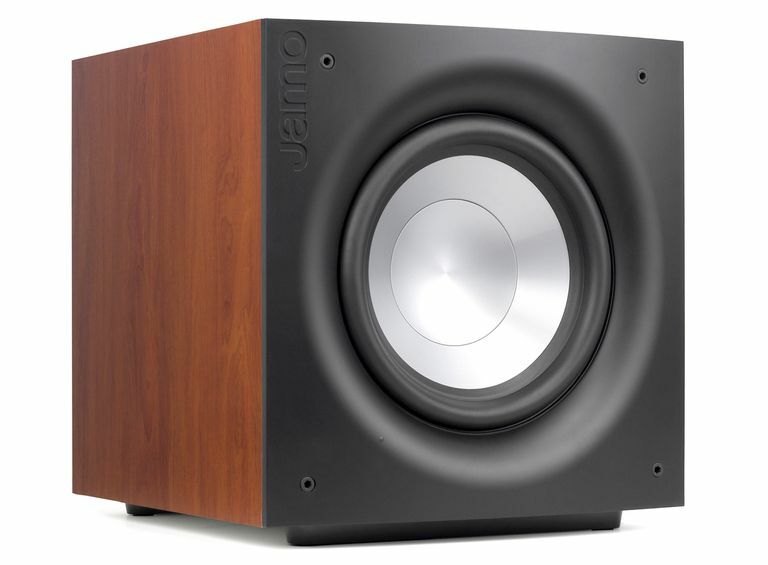 The four subwoofers from Jamo featured above are definitely worth considering. Producing clean, tight, bass any of them can complement a home theater setup in a medium size room—for large rooms go for the 12-inches. Even though they are designed to complement Jamo's Studio and Concert Series speakers, you can use them with other speaker brands if you take care in matching the crossover points of your speakers with the Jamo subs. Also, if you are concerned about cluttering up your room, they come in both wood and white finish. The white finish option is not a common color for a subwoofer.